Being one of the well-distinguished companies in the market, we are offering Window Roller Blinds. Optional upgrades includes Cassette as well as Spring Assist Motor-Up and Motorised systems.
" A Room with a View"
Louverline Blinds offers a unique combination of aesthetics and functionality for modern houses and commercial working places with its De-Lite product line. De-lite blinds are made out of 55 mm wide suspended fabric vanes which are placed between two sheer fabric facings that give you excellent light control. 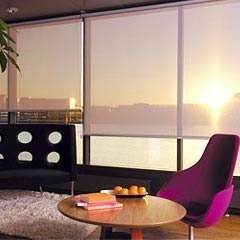 Roller Blinds are probably the world's most popular window covering. They are a good all-round solution, offering an efficient way of controlling the amount of light entering a room. PVC Roller Blinds are made of PVC slats and are woven together with high strength poly thread. 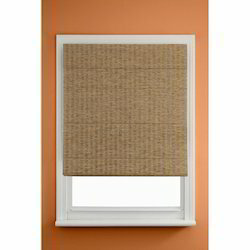 These blinds are widely used for exteriors. The blinds are available in rolls which needs to be cut and fabricated to fit the window/ balcony size. The rolls come in 5 feet and 6 feet and are in 10mts and 20mts in length. 9 shades available. - Roller blinds, or roller shades as they are sometimes known, use a minimal amount of fabric, lay flat against the window and roll up to let a maximum amount of light into the room.